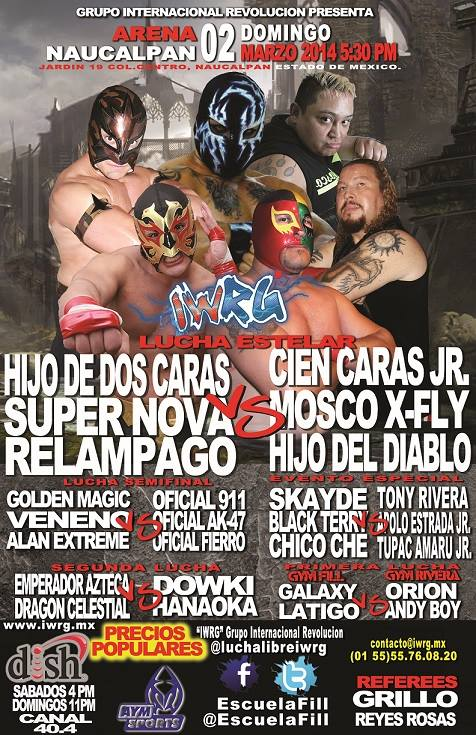 All the IWRG guys fouled the Skayde guys for the win! one fall. Technical match until the end. Terry got the backcracker and was going for a leg hold, Skayde's team ran in, Terry's team ran in after them, and the ref called the whole thing off. Danny's first match here since July. Veneno won with a top rope senton on X-Fly. 1) Alfa & Hip Hop Man b Látigo & Matrix Jr.
Straight falls. Latigo replaced MS-1 Jr.
"Sadik Maiden" was actually Magnifica, though the TV announcers had no idea who she was (or she's changed her name.) Definitely a new Espectrito - this one's thin! Rudos were DQed in the first for excessive violence. Rudos tied it up in the second. Terry fouled Rivera and faked a foul - crowd convinced the referee that Terry was innocent so his team got the win. Gym FILL vs Gym Skayde. Rematch of a rematch. Winner faces Gym Tony Rivera. Terry submitted Skayde for the final fall when Fulgor provided a distraction, so the home team wins the feud. Hanaoka replaced Sadica, so it was 3 men vs 2 men & 1 La Magnifica. 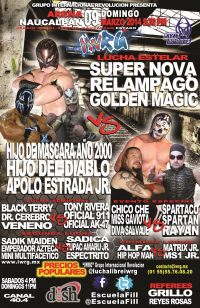 Emperador Azteca wants a shot at Imposible's title. Imposible asked a fan, who said no. So, no. 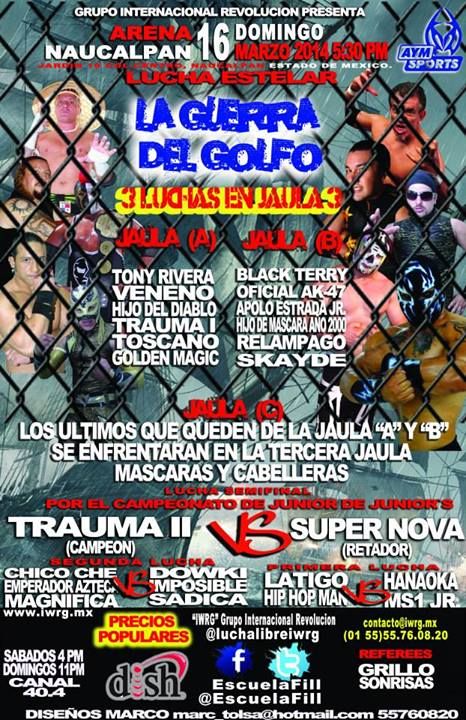 Trauma II falls on third defense, Super Nova wins the title. Order of escape was Trauma I, Toscano, Golden Magic, Diablo and Veneno, leaving Tony Rivera to advance. Skayde wrestled without his mask. 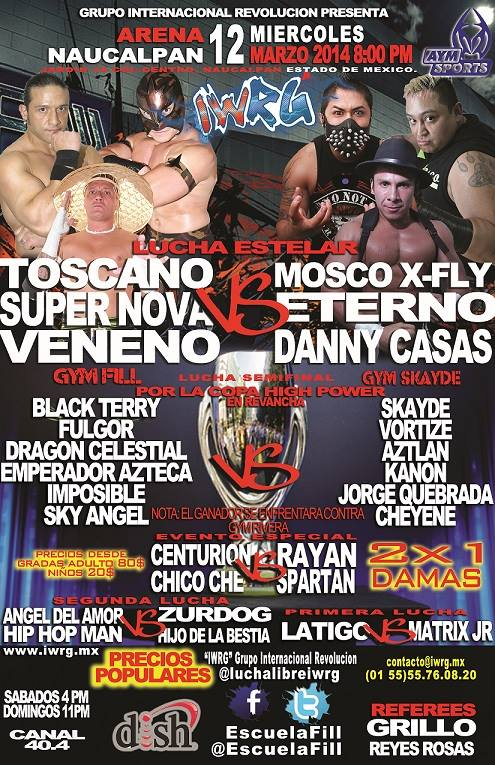 Order of escape started Apolo, Skayde, Hijo de Mascara. Terry & Official tied Relampago's mask to the ropes to trap him, but he just unmasked himself, covered himself with his shirt, and left. Tony Rivera tried to help AK47 so Terry would lose, but it backfired and AK47 lost instead. Tony tied AK47's boot to the ropes and climbed out for the win. Oficial AK-47's second hair loss in just over three months. Tony claims this is his 57th hair match win. Return from injury for Mr. Leo, debut here for Metaleon. 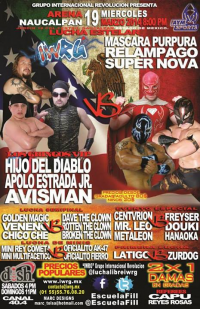 IWRG debut for Broken Clown. Straight falls. Dave fouled Veneno in the first, beat by Veneno in the seocnd. 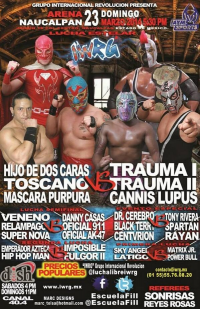 Gringos took 2/3, Avisman pulling Mascara Purpura's mask and beating him. 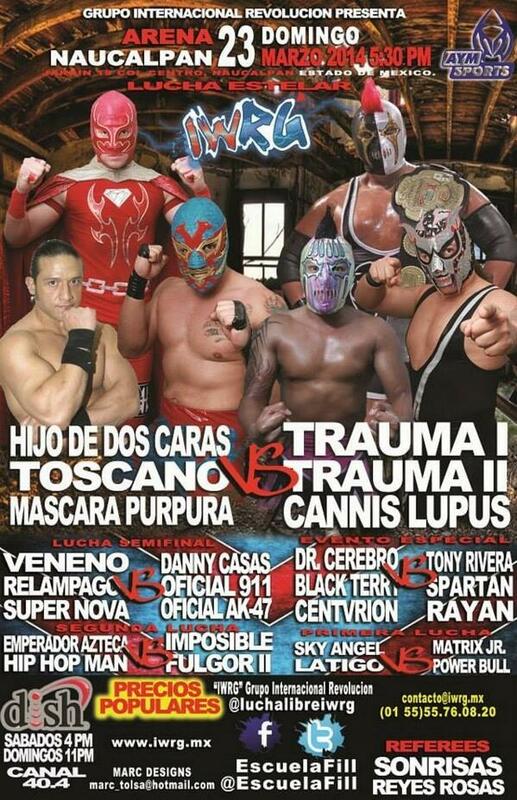 Tecnicos demanded revenge and a title match. Hip Hop Man replaced Latigo, Arana de Plata replaced Power Bull. Alan Extreme replaced Hip Hop Man. Tecnicos took 1/3, Terry using the ropes to beat Rivera. Tecnicos took 1/3, Veneno feuding with AK47. 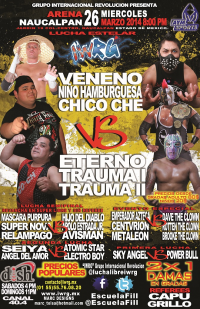 Tecnicos won in straight falls, setting up a title match. 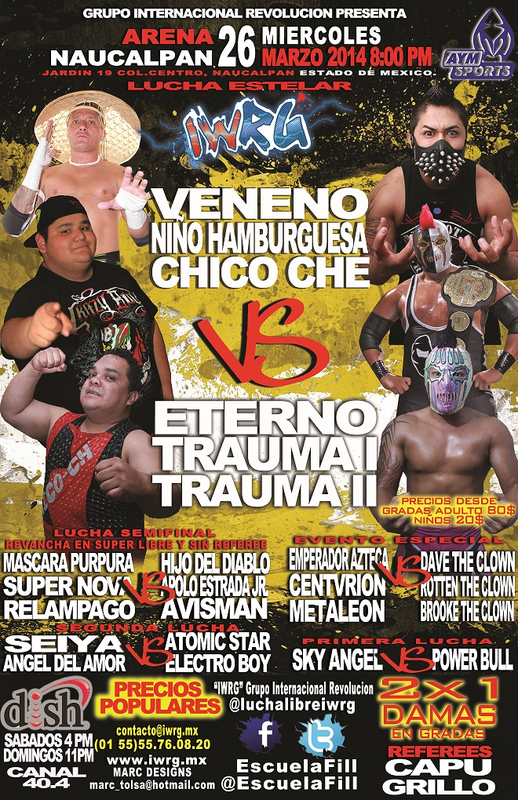 Team Weird People won when Trauma I and Eterno hit each other by accident. Eterno attacked the Traumas after the match and vowed to bring back to Familia de Tijuana. Atomic Star replaced Matrix Jr. Match was building the Imposible/Azteca rivalry. Azteca was heading to the mat head first after a backdrop, put his arms down to protect himself, and severely injured an elbow. The doctor immediately ran in to check on him, and the rudos quickly beat the tecnicos to end the match. Hip Hop Man joined Gym Rivera before the match (replacing Guerrero Mixtico), but acted as a neutral in the team versus team fights. Match came down to Black Terry versus Tony and Orion. Terry ave Orion front and backcrackers, but Rivera threw powder (said to be lime) in Terry's eyes and Orion covered for the pin. The second referee saw the powder and overturned the finish, DQing Team Neza. This set up Tony Rivera versus Black Terry in a hair match next Sunday, which Tony was not happy about.